Rallies in support of the Palestinian victims of Israel’s military onslaught were held across the world’s major cities this week. 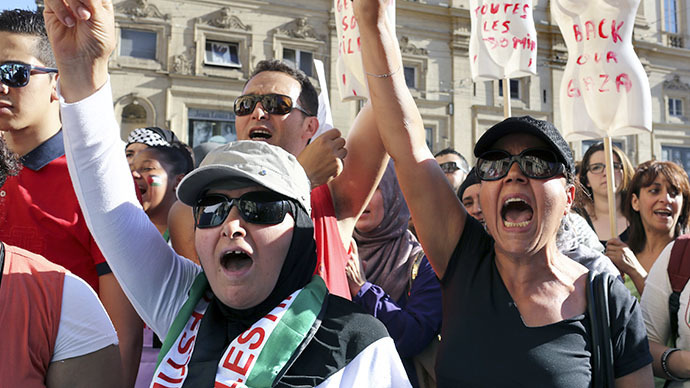 Thousands marched in France, Germany, Argentina, the US, the UK and other countries. The demonstrations took place before Israel announced it had begun an extensive ground offensive in Gaza – the first time it has done so since 2009. 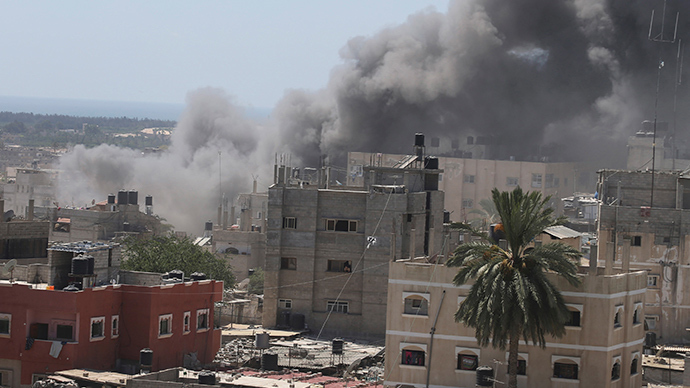 According to statements by the Israel Defense Forces, the operation is intended to clear Hamas fighters from areas and tunnels from which they could launch rocket attacks. Currently – live updates on the situation are available – it’s believed that numerous Hamas fighters as well as civilians have been killed. 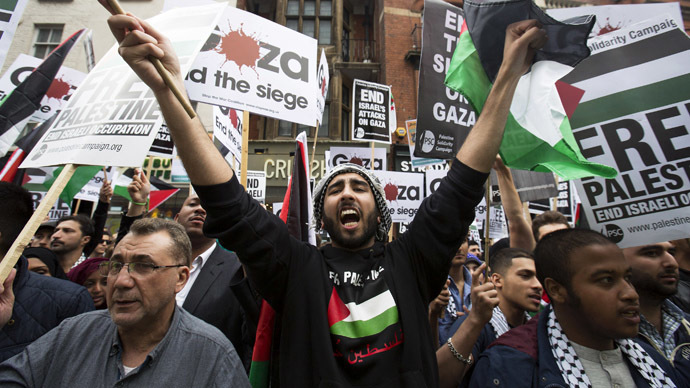 In the meantime, the British capital saw one of the largest turnouts with thousands of protesters rallying outside the Israeli Embassy on Friday. Demonstrators flooded the streets around the building waving placards that read “Gaza: End the Siege" and "Freedom for Palestine." The same took place in the Norwegian capital, Oslo. In the Argentinian capital Buenos Aires, the Federation of Palestine Entities, the Committee of Solidarity with Palestine and other human rights groups gathered at the Israeli embassy to voice their protest at the rising death toll of Palestinians at the hands of the Jewish state. With the recent Egypt-proposed ceasefire failing to have the necessary effect, fatalities continue to pile up. 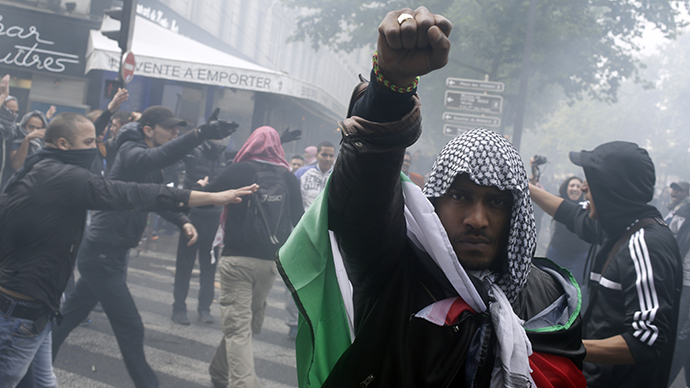 In France, things got very real in several cities, including Lyon, Toulouse and the capital, Paris, where last Sunday saw more than 10,000 take to the streets – an event that started out peacefully, but ended in stone-throwing between pro-Palestinian supporters and Jewish protesters. Some Jews were holed up in two synagogues guarded by the police against a furious crowd. Since that incident, the remainder of the protests to be held until the end of the week have been canceled by the police in several cities at the behest of the government, amid fears that a sharp escalation in civilian violence in France is otherwise inevitable. The country is home to some of the largest Palestinian and Jewish communities outside their homeland and their animosity towards each other is beginning to reflect that which is witnessed in the Israel-Gaza standoff. 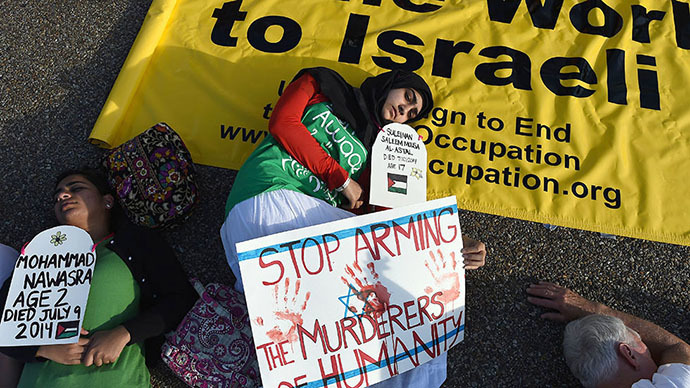 In the United States’ capital, Washington, DC, demonstrators gathered to re-enact Gazan deaths, putting on a performance pretending to be dead as they lay on the pavement outside the White House. Dozens of activists, wearing keffiyeh scarves and shirts blotted with fake blood attended the spectacle. “Authentic Rabbis always opposed Zionism,” one Jewish banner read, as a segment of the faith gathered in solidarity. Yisroel Dovid Weiss of the organization Jews United against Zionism told RT that “this ideology Zionism is transformation purely from religion to nationalism… it has no basis in the Torah. The Torah in fact clearly states that we are forbidden since the destruction of the temple 2,000 years ago to create our own sovereignty." One activist of Palestinian origin said that during her last conversation with her family back home, she could hear bombs falling in the background over the phone. The same took place in other cities, like Australia’s largest city, Sydney, where more than 4,000 people joined the rest of the people across the globe on Sunday to demand the ending of the Israeli shelling of Gaza. “This is against UN laws but the UN is not doing anything about it … That’s why we are here – to make the world aware that injustice is happening and you cannot sit there and just ignore it,” protester Al-Tobi told the newspaper. One protester, however, was not swayed by calls for peace. Hamza asked RT: "Why should I accept it? Why should I accept it if Netanyahu tells his army 'kill everything that there is, kill everything.' A Jewish immigrant, do you know what he said to me? We will do with the Muslim women whatever we want as long as we want until they stop dancing with headscarves on our American tables. Yes, a Jewish immigrant. He can bury himself next to Hitler." The demonstrators held signs with the names and ages of Palestinian citizens who have been killed as a result of airstrikes and artillery fire. The names of the dead were then read out. 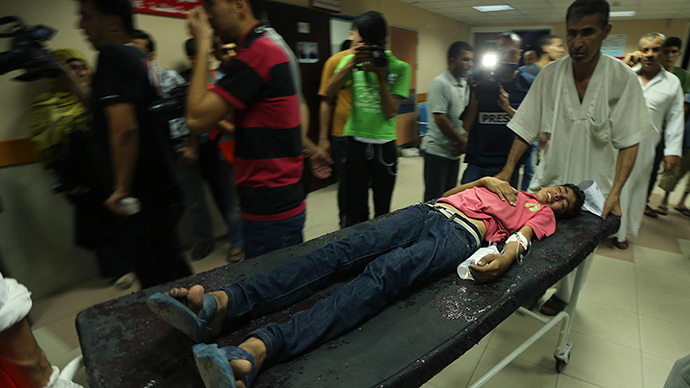 Estimates now put the Palestinian dead at a minimum of 210, with one Israeli killed.